"آپ سے زیادہ مرتبے اور زیادہ جاننے والے انسان مطمئن بیٹھے ہوں تو آپ کو فکر مند ہونے کی ضرورت ہی کوئی نہیں ہے. جہاں جاننے والے ہوں وہاں نہ جاننے والوں کا پریشان ہونا ناجائز ہے." An interesting reply by Wasif Ali Wasif (r.a.) to a question about future of Pakistan. Wasif Sahib in simple words told everything. Ab bhi koi na samajhe to ye uss ki apni na-samajhi hai. Asalaam Alikum, Wasif Ali Wasif ki is baat sey key 'Islam kabhi khatam nahi ho sekta' se sabit hota hai key jo loog kehtey hai key 'Qital karo Islam Khatrey main hai' Ghalet kehtey hai.... Qital jab farz hota hai jeb Islam nahi Muslelmaan aur un ki izzetey khatery main ho yani defensive wars like in Kashimir and Afghanistan.... Aur jab mulk main civil war aur fitnah ka khatra ho to humey apney Hiteyaron ko toor dena chaheay. Main chand hadiths picheli post main dey chuka ho. so you mean that if pakistani army keeps on killing tribal people like it is killing nowdays(under american orders) than tribals should not fight back and let army slaughter them as its tribal muslims duty to die? (in north wazir area army,s mortar shells killed dozens of tribal women and children last week). @Anynomous "you ppl in nationalism have distorted even islam.pakistan is nothing but a piece of land,all importance lies with islam.pakistan too had importance till it was an islamic state now its just a puppet of america against mujahideen.truth is bitter but you ppl also must stop living in fools paradise.you can deceive anyone but cant deceive our creator"
BROTHER YAHI MERAY DIL KE AWAZ HAI. ASAL MAI YE NAM NIHAD ISLIAM KE DAI SIRF PAKISTAN KO AS A STATE POJHA KARTAY HAIN. IN KE LIAY ISLAM AUR PAKISTAN MAI AGAR AIK KO SELECT KARNAY KA OPTION DIYA JAI TO YE LOG BLINDLY PAKISTAN KO SELECT KARAIN GAY.JISS KE MISAL HUM LOG ROZANA DEKH SAKTAY HAIN. YE LOG FULLY BLIND HAIN PAKISTAN KE HUKUMAT AUR FAUJ KHUL KE AMERICAN DAJJAL KE ITTEHAD MAI MUSALMANO KO ROZANA SHAHEED KAR RAHA HAI YA SHAHEED KARNAY MAI KUFAR KE HELP KAR RAHI HAI. MAGAR YE LOG DAJJAL KE ASAR KE WAJA SE PAKISTAN KO KHUDA KA DARJA DENAY KE WAJA SE ANDHAY PAN KA MUZAHIRA KAR RAHAIN HAIN. @All three Anynomous and Al Muntazir. I don't know from where you get that I am saying Drone Attacks are good. I said defensive war of Afghanistan and Kashmir against USSR and India was legal. I said only Qital and bloodshed against civilian, our own country and people i.e. civil war is totally Haram and Kufr. At time of Fitnah and end time it is totally not allowed. In whole Islamic history great Islamic scholars and Sufis did Jihad (struggle) against cruel rulers and faced punishments but never said others to shed blood of others. I write above what our Prophet Muhammad (saas) ordered us in time of tribulation. From your name I think you are muntazir of Imam Mahdi. So be happy he will appear soon and he will not shed blood. @"BROTHER YAHI MERAY DIL KE AWAZ HAI. ASAL MAI YE NAM NIHAD ISLIAM KE DAI SIRF PAKISTAN KO AS A STATE POJHA KARTAY HAIN." "Nationalism, in the most common sense of the term, refers to an individual's love for his people and for his country. This is a good and completely legitimate sentiment. Since it does not go against religion, it has no damaging effect for humanity. Just as an individual's love for his mother or father is a legitimate feeling, so also is love for the nation, that nurtured him in a common faith and culture, a legitimate feeling. Nationalistic sentiments become illegitimate when they become irrational or overly passionate. If a person, out of love for his country, begins, without justification, to harbour feelings of hostility towards another nation, or tramples over the rights of other nations and peoples in the interests of his own-for example, if he seizes their land or confiscates their property-he has exceeded legitimate bounds." @AMERICAN DAJJAL KE ITTEHAD MAI MUSALMANO KO ROZANA SHAHEED KAR RAHA HAI YA SHAHEED KARNAY MAI KUFAR KE HELP KAR RAHI HAI"
Dajjal is not any country. There are two types... Dajjal and Ad-Dajjal. People mix both. One is world wide philosophy, Satan, Jin who was chained at time of Prophet (saas). This world is also Dajjal or Dajl (illusions). Other Dajjal is a human representation of Satan who will emerge during Caliphate of Imam Mahdi. Not only Christians, Jews and Atheist but Muslims are also follower of Dajjal. Majority of people are under hypnoses of Dajjal including you and me. Communism, Marxism, Capitalism, Socialism are all philosophies of Dajjal. Only Imam Mahdi will break this hypnoses and Prophet Isa (a.s) will kill him. Main characteristic of Dajjal is doing bloodshed on whole world. Any one who is doing drone attack, suicide attack or road side bomb blast is follower of Dajjal. @"PAKISTAN KO KHUDA KA DARJA DENAY..."
Koi Pakistan ko Khuda ka darja nahi de ra ha hai. Sab Jantey hai ke ye shirk hai. Ager hum koi bhi darja Pakistan ko detey to Pakistan ka ye haal nahi hota jo ab hai. @"BUZARGON KE PESHGOIYON KO HE LAY jESAY HAZRAT NAIMAT SHAH WALI r.a...."
Ye app ki ghalat interpretation hai ke SIRF Qabaili alaaqo aur afghanistan key loog Ghazwa-e-Hind Karey gey. Hadith se saabit hai key Imam Mahdi ki forces jis main mukhtalif nations key loog jin main afghanistani, irani, pakistani, arabs aur turks bhi shamil hongey sindh (pakistan) aur hind (india) ko fatah kerey gain sirf aman laney ke lieya as peace force. ye logo ko nahi marey gey balkey armey se lary gey aur hukmaranon ko zenjero se paker ker imam Mahdi key samney le ker aey gey. All we need is unity, faith(ALLAH, Prophet Mohammed P.B.U.H) discipline in our life. It will make a difference i'm sure. Faith, Unity and Discipline are great three tasks of Imam Mahdi. No one can complete these tasks before him. First task is correcting faith of all people, second task is make unity by creating Caliphate and third task is discipline using implementing moral values of Quran and Sunnah across world. Can you introduce yourself who are you? This dream has a lot for the ones who are seeking the "truth"
Ae Logon paraeshan honay ke zarorat nahi.Hath pe hath rakh ke batay raho. Zardari,Gilani, aur Obama jo bhe kartay rahin inhain karnay do aur apnay mouj mazay karo. Total contradiction with "Khuda oss kom ke halat kabhe nahi badalta, na ho ihsass jisay apni halat ke badalnay ka. I can not agree with wasif sahab on this matter. Na karain agree. O bhai koi wajah hai to Wasif Sahib farma rahe hain na. Agar aap samjahna na chahain to aap ki marzi. kisi gharib ko agar insaf nahi milta ya os ko agar aik waqat ke roti bhe mushkil se nahi milti to gham na karo,mustaqbil roshan hai. Agar kisi musalman ke maa,bapp,bewi,bachay ya bhai behan kisi drone attack mai shaheed ho jai, to khamoshi ikhtyar karo kuonke mustakbil to roshan hai. Agar aik telented ghareeb degree holder nowjawan ko aik aam sa rozgar baghair rishwat aur sifaresh ke nahi milta dosri taraf jiss ke torhi bohot siyasi parti ke sath rawabit hai to oss ko rozgar ka koi masla nahi merit to hai nahi,baghair test interview ke esay logon ko sifarash par bharti kia jata hai,to fikar na karo mustaqbil to roshan ha. Kia faida easey roshan mustaqbil ke..hai koi faida. App log practical step lenay ke baat kyon nahi kartay aur logon ko fantasy ke dunya mai rehnay ke liay kahtay hain kyon aakhir kyon??????? Haan mustaqbil roshan hai. Afsos k aap ne post nahin parhi aur comment kar diya. Do you want dark future? You want bright present because you are living in present??? Bright present for one generation and dark future for all next generations??? strange logic!!! Faqar bahi ney fiqr ki aur yeh blog banaya... app ney keya kia? "Do you want dark future? You want bright present because you are living in present??? Bright present for one generation and dark future for all next generations??? strange logic!!!" No i don't want dark future,it is your own assumption according to your habit of false interpretations of everything. I meant in these comments struggling for better present and bright future, i disagree with wasif sahib's view of laying idle and doing nothing because " Agar aap se siada martabay aur ziada jannay walay motmian bethay hon" IN these times if they are staying calm and doing nothing for the betterment of muslims than i think they are doing sin.because zulm ko khamoshe se sehna bhe zulm hai.You got it? Faqar brother also misunderstood my above comments i mean doing struggle and jijojehd for the present and future. If I'm doing wrong interpretation then you are doing doubt in intentions of others. Do you like only those interpretations who match your thinking. As individual we can do efforts only in our limits. So for bright future we have to join any global organization who is working for Islmic Union. I joined Harun Yahya. You can join Tanzeem, Hizb-e-Tahrir, Tahir ul Qadri, or any other organization which you like. Individual you can't nothing. Please don't judge others if their interpretations are not matching with your thinking. @"You can join Tanzeem, Hizb-e-Tahrir, Tahir ul Qadri, or any other organization which you like. Individual you can't nothing." I have no intention to join these organization it least Harun yahya and Tahir ul Qadri. I have no intention to spoil my Eman. @Anonymous who hate Tahir ul Qadri too. I never said you to join Harun Yahya?? I don't know you hate Tahir ul Qadri. If I knew it I don't write his name in list. I don't know Ghaib. I wrote... join any organization that you like. 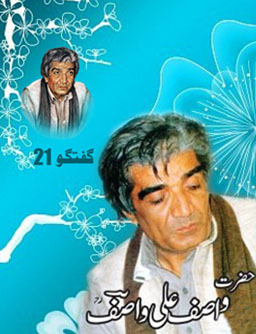 Bohat ala collection and i give you 100 out of 100 khas tor p Wasif Ali Wasif (r.a.) k jawabat awesome.